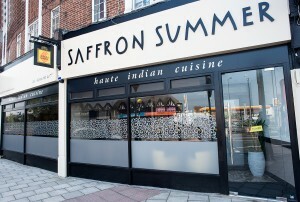 Saffron Summer, the award-winning Indian fine dining restaurant in Chessington in Surrey, is offering free meals to children for two weeks around the Easter holidays. The restaurant led by executive head chef Awanish Roy, who previously worked at London’s renowned Cinnamon Club, was named ‘Best Newcomer’ at the Asian Curry Awards last year. The legendary Pat Chapman, Editor of the Cobra Good Curry Guide, said when visiting Saffron Summer, “You won’t find better Indian food anywhere,” which is confirmed by its being ranked No. 1 Indian Restaurant in Surrey on the TripAdvisor reviews website*. During National Vegetarian Week (13th to 19th May), Saffron Summer will be serving a special three course vegetarian menu, with optional vegan drinks pairings, for around £24.95 a head. For each one served Saffron Summer will donate £1 to the Curry for Change charity, which works to alleviate hunger in rural Africa and India.